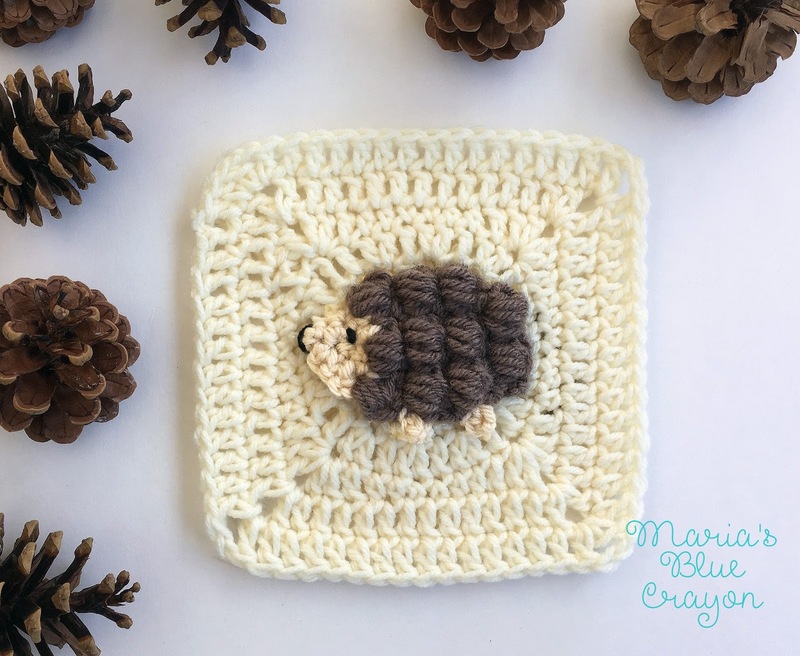 GET THE HEDGEHOG APPLIQUE ALONG WITH THE GRANNY SQUARE CROCHET PATTERN IN AN AD-FREE PDF DOWNLOAD HERE. OR SCROLL DOWN FOR THE FREE PATTERN. We just had our first snow fall here in Central Pennsylvania! That means we had a snow day and I had lots of time to hunker down and get crackin’ on this afghan! I have two new squares to share with you – this little hedgehog and a bear that you can check out here. Along with that, I have done the math to figure out how many squares I will need to make this afghan. It will be a bit larger than an average throw. Click here to check out all the details you need to follow along! I am planning about 10 different woodland critter/themed granny squares, so we’re about half way there! PIN IT TO YOUR CROCHET BOARDS. Insert hook at second puff stitch and sc in two spaces. Fasten off. Skip two spaces, sc in next two spaces for second leg. Fasten off. You are welcome to share this pattern and to make this for sale, but please link back to me as the designer. Do not in any way alter my patterns and publish them as your own. For copyright information, please visit the link at the top of my page “Copyright/Disclosure”. Can you tell me what size hook you are using for the hedgehog? G hook 4.0mm, I apologize I forgot to add that to the materials list! i didn't specify (but will) that it is a SC increase. Increase means you make 2 SC into one stitch or space. The number in parenthesis is the number of stitches you should have in that row. Hope that helps! On row 4, where do I put the next stitch when you say continue to crochet around? Thank you for your explanation! Now I got it! I'm crocheting along with you. So far I made 4 animals. 3 each. The hedgehog is my 5th. I've done all the squares. It's very enjoyable thus far. You're awesome! This is so cute! Thank you so much for making this a free pattern, I can't wait to make it. Just blown away and can't wait to read more and even crochet some of them!! !Thankyou so much !